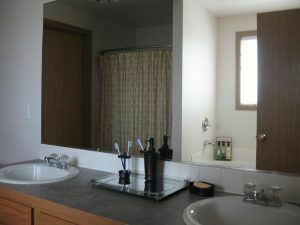 In most households – whether inhabited with big families with kids, couples or single persons – bathroom plays very important role. It’s a functional room for performing daily hygienic routines as well as a corner for relax and in a way can even be referred to as a local home oasis of SPA or tropical resort. Modern décor and interior elements help creating whatever atmosphere and style is needed. 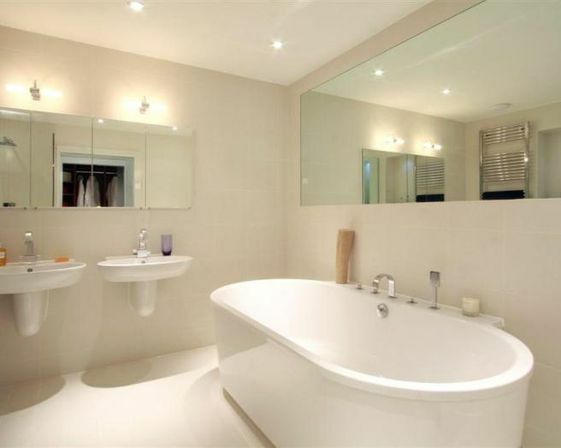 Mirrors can be mentioned as essential items in any bathroom interior. Depending on their size and type, they can be either additional décor or key interior elements. Thus, it is highly recommended to plan everything concerning mirrors ahead, when bathroom interior scheme is being developed. One of multiple ways to go can become a large bathroom mirror or even a combination of large mirrors. Large bathroom mirror, becoming one of dominative interior elements, bears its positive and negative aspects which are to be considered before settling on such a bathroom interior solution. First advantage comes from mirror’s nature itself and its obvious primary function. The larger reflecting surface is, the more convenient it is to get ready in front of this mirror. Large mirrors, providing full-length reflection of person’s figure, allow checking out general impression as well as separate details. Most city apartment bathrooms don’t have any windows and lack of space. Large mirror, especially combined with proper lighting, works a real miracle in creating optical illusion of spacious well-lit room. Mirrored surfaces make interior look classy and stylish. 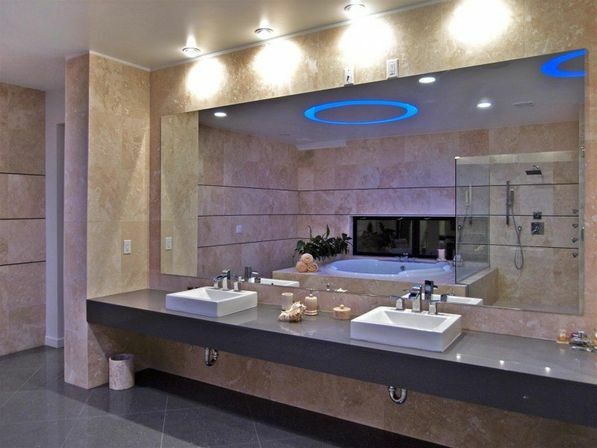 Among various bathroom mirrors large mirrors are the ones that can really add some luxury touch to interior. Large mirror in bathroom sometimes can spare you from investing into big standing mirror in the hall. Having full-height mirror in bathroom, it is possible to bring get-together area there, leaving a hall with just a small mirror for quick check of appearance before departing or once on arrival. Large reflecting surface can spare owners some electricity costs. Any source of light, reflected in mirrors doubles its lighting intensity. So, with large mirrors one would need less actual lights. Same trick happens with furniture. Put in front of large mirrors, furniture reflects in it and room doesn’t look empty anymore. Thus, large mirror can spare some furniture costs as well, provided that few furniture pieces are enough to fulfill their practical functions. Large mirrors require some space and may not fit in real tiny bathrooms. Large mirror, as a rule, becomes a central figure in bathroom interior so that one is forced to plan the whole bathroom interior around it. 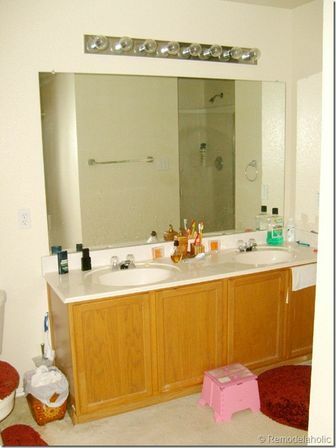 In case of even slight remodel of interior this large mirror might look inappropriate and might need to be removed. Large mirror requires daily care – cleaning and wiping off some occasional water drops – in order to look neat. 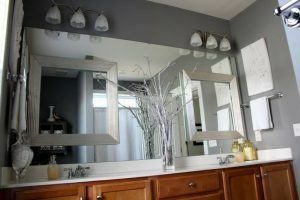 Large mirrors, especially well-lit, would enhance all flaws of furniture and walls surfaces as well as would bring out occasional dust, spots and stains. 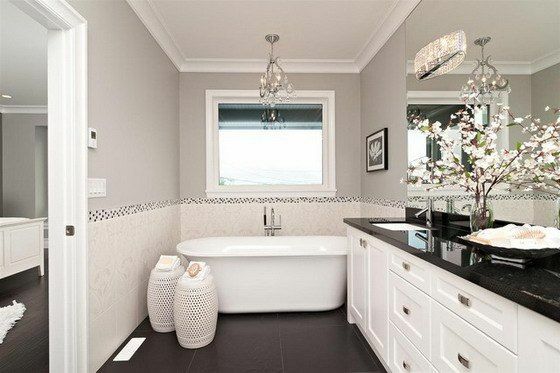 Thus, it makes it necessary investing in high quality bathroom furniture and décor materials and cleaning them more often than usually which can be both expensive and tiresome. Mirrors usually are quite pricy. So, large mirror would increase expenditures. 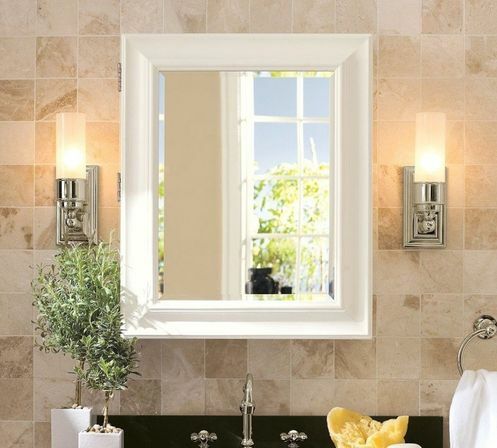 Along with decorative interior functions, mirrors are practical appliances first of all. To serve their main goal – giving precise reflection of objects – mirrors are supposed to be of high quality. It is especially true when it comes to large bathroom mirrors. All defects will be several times more visible on large surface. Quality bathroom mirror should meet high standards of safety, water resistance and have fine reflective surface. There are mirrors, specially designed for use in bathrooms with its frequent change of temperature, high level of humidity, water condensate and water drops within reach. Such special mirrors have reflecting surface, frame and all decorative elements coated with special anti-corrosion protection. This enables mirror to last longer. Safety is very important feature as well, especially in bathroom, where people spend much time without protection of clothes and footwear. It is possible to choose solid and shock-proof mirror which is very unlikely to be broken. For safety reasons, many manufacturers cover surface of mirror with protective film. This film would keep all glass particles in case mirror is eventually broken. Quality of reflecting surface is what determines whether good or bad this particular mirror is for performing its main goal. High quality mirror is comprised of many layers – glass layer, reflective layer and several protective layers – and is at least 4 millimeters thick. It has even surface with no flaws and gives adequate reflection without any distortions. 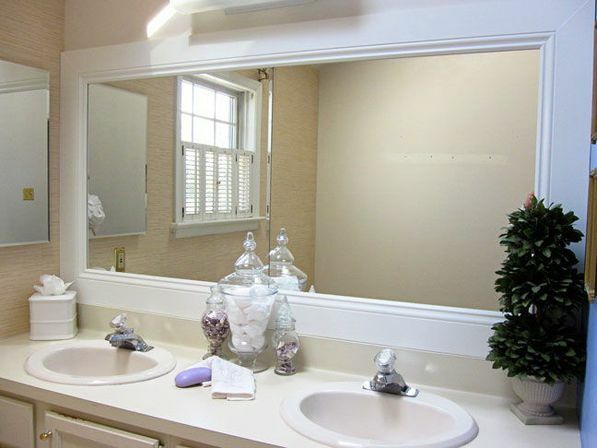 To make mirror look great for long period it is important to take care of it. Wiping it with a cloth, soaked in special mirror detergent, would keep mirror surface clean and protected. Whole wall mirror. It can be comprised of several big frameless rectangular mirrors, fixed tightly to each other. Such a big mirrored surface creates panoramic effect and sets walls apart in a real magical way. Ii also can cover one of the room’s corners for giving bathroom almost infinite depth. 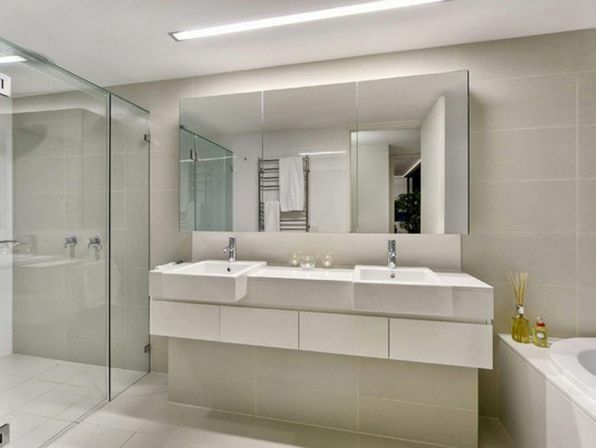 Such mirror wall is best placed just opposite of bath tub or on bath tub’ side wall starting from its top and going up to the ceiling. As a more practical alternative of this design idea along the wall there can be put several mirrored closets, placed tightly one to another – this adds a great space for storage various bathroom necessities. Set of point lights would look very appropriate with such mirrored wall. 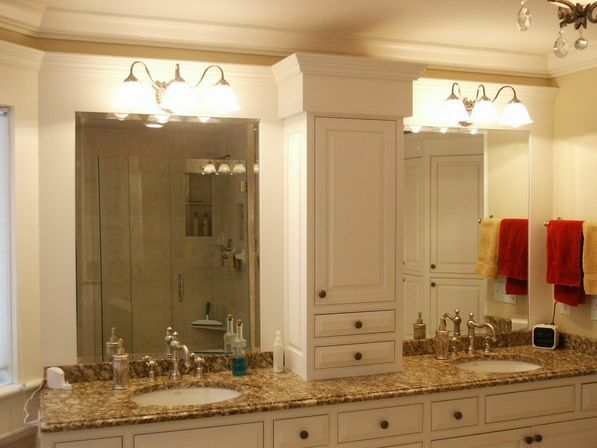 Large bathroom vanity mirrors can be said to be a very popular solution for rather spacious bathrooms. 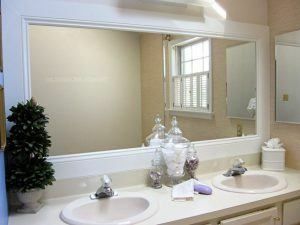 Most common shape of large vanity mirror is rectangular. If the room cannot boast of high ceiling, it might be better to set large mirror horizontally. This option will look especially natural over two sinks. 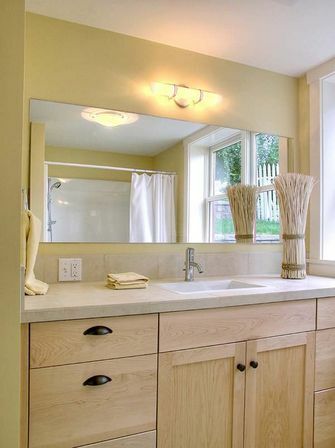 If there is one sink, next to it can be put a dressing table, vanity or some cabinet. 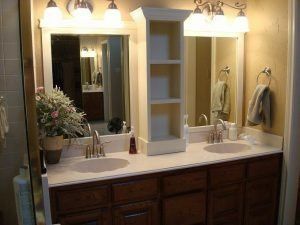 Large bathroom vanity mirror can include convenient shelf for storing toiletries and cosmetic products. Large framed bathroom mirrors are very attractive and convenient in use. There are two main types of framed mirrors: wall mirrors and standing floor mirrors. 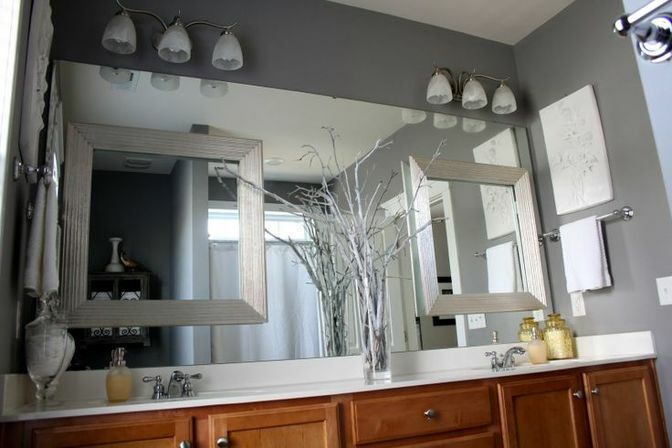 Since wall large mirrors require less space, they became more popular. Depending on material, color and design of frame mirror can belong to various styles. Wooden framed large mirrors are ideal for summer cottages and rustic interiors. Wood doesn’t like contact with water so, in order to last long, wooden frame should be coated with special waterproof anti-corrosion protection. 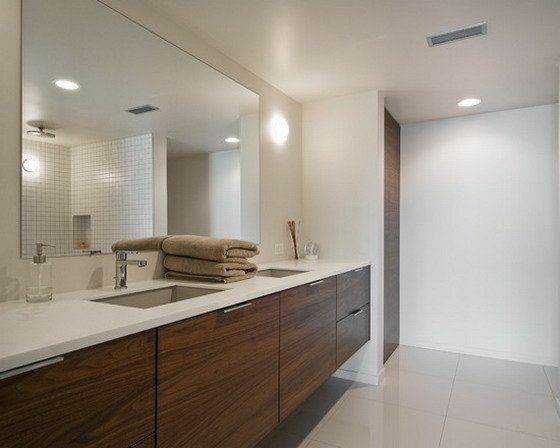 Best shape for wooden framed large bathroom mirror would be rectangular. Metal frames, thin as rims, show example of modern urban style; to pull up this style any regular laconic shape would do – oval or rectangular. 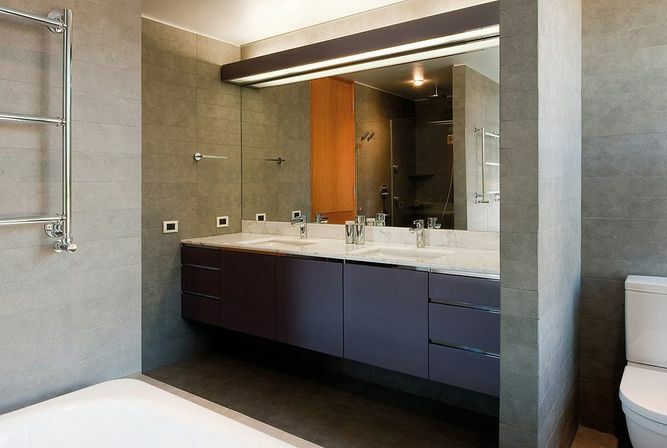 It is important to keep in mind that the more decorated and complex frame large bathroom mirror has, the more supporting interior elements it requires to be incorporated into whole interior plan. While basic neutral frames (perfect example of such simplicity can be found, for instance, in IKEA) make it possible to add large mirror in most any bathroom interior. 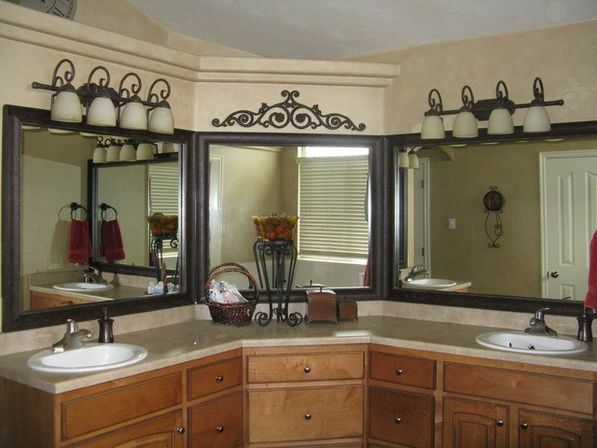 Antique large bathroom mirrors form special group of interior elements. Bought in antique stores or on special auctions, being real old artifacts or decorative design replicas, those objects deserve special treatment as they require whole interior concept to be played around them. Large oval Venetian or baroque mirror with lavishly decorated frame would require neutral décor of bathroom wall – as a clean canvas for exposing work of art. It is especially true if mirror has traditional golden frame. You can have this frame painted in matt neutral color, such as white, for easier styling this complex interior element into bathroom. Romantic large vintage framed mirrors can be both of oval or rectangular shape. Paint on such frames, as a rule, look old; if it is not originally old, frame surface is usually artificially distressed. Ii is important to keep in mind that most of antique framed large mirrors have not been specially designed for bathrooms and, thus, it is better to coat both mirror and its frame with protective anti-corrosion formula. Large bathroom mirror in a mosaic frame can recreate an atmosphere of old antique terms in a regular city apartment. Best color scheme for mosaic frame is blue spectrum with occasional sparks of white and golden. 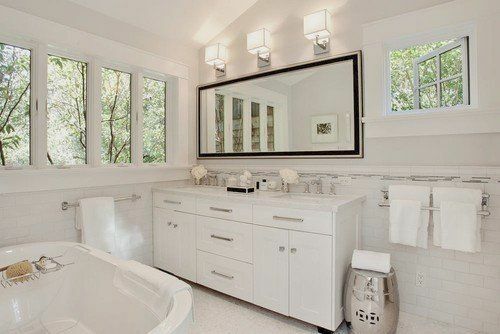 Large bathroom mirrors need some light to expose their exquisite beauty. Point lighting would be optimal for mirrored wall. Vanity mirrors would look great with the soft lighting of in-built LED strips. 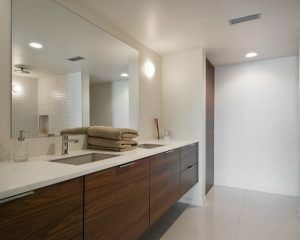 LED light, streaming from behind, would give vanity mirror extra dimension. For framed large mirror lights should be chosen to match with the color, texture and style of the frame. For antique framed mirrors lights should come in appropriate style; vintage sconces, made of distressed metal, for instance.